The pair accelerated lower on Wednesday, as the greenback weakened across the board on signals of stronger than expected China's economic growth, with Canada's CPI in line with expectations (Mar 1.9% vs 1.9% f/c) while trade gap unexpectedly narrowed in Feb (-2.9b C$ vs-3.5b C$ f/c). 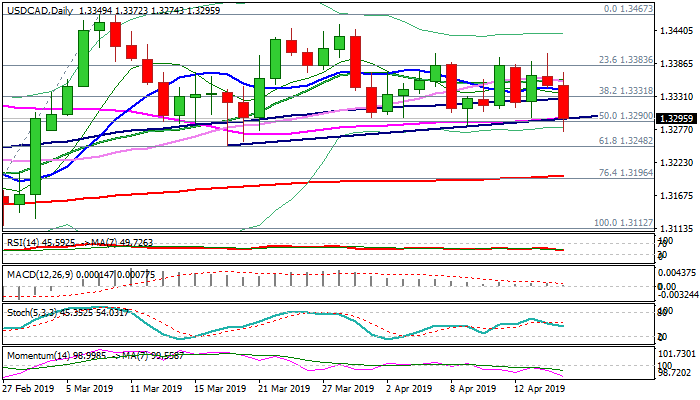 Fresh weakness dipped to one-month low at 1.3274, after breaking below the base of thinning daily cloud, reinforced by 55SMA (1.3291). Rising negative momentum helps bears along with south-heading stochastic and daily MA's (10,20,30SMA) in bearish setup. Bears need close below daily cloud to confirm negative scenario and expose supports at 1.3250/48 (19 Mar trough/Fibo 61.8% of 1.3112/1.3467). Stronger bearish acceleration could risk stretch towards next key support at 1.3199 (200SMA). Broken 100SMA (1.3327) now marks solid resistance which should keep the upside limited and maintain fresh bearish bias.